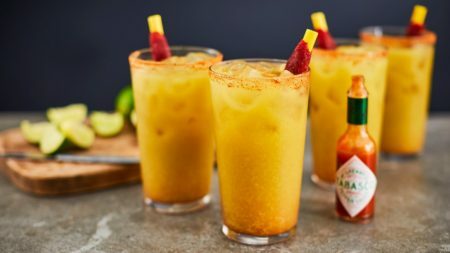 The “Big Game” is taking place this Sunday, and what better way to celebrate than with a special michelada recipe to enjoy during your game day festivities. Mexican Mixologist Jose Medina Camacho of Birmingham bar “The Marble Ring” is elevating the traditional American Pale Ale or Mexican beer and adding tomatillos, poblano peppers and Tabasco Sauce for a bold kick of flavor. Whether you’re hosting your own homegating party or watching elsewhere, one thing both Eagles and Patriots fans can agree on is this michelada.